YOUR TIME SHOULDN'T BE SPENT WORRYING ABOUT LAKE & POND WEEDS Weeds on your lakes and ponds are a giant headache. Stop stressing over your weedy water. Our local, veteran-owned team can help! 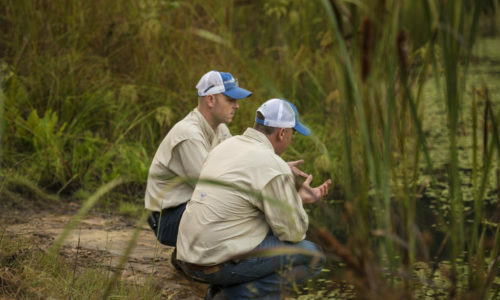 Great customer service is our top priority because we know how important clean ponds and lakes are to you. We’ll take the time to make sure you know exactly what you’re getting from Aquatic Weed Wizards and exactly how much it will cost. Our local, veteran-owned team is dedicated to quality work, fair prices, and the kind of service that makes you want to recommend our company to friends and family. AWW is proudly registered with the Tennessee Department of Agriculture, Charter #5171. We use methods proven to control your lake and pond weeds without killing your budget, your watersports, or your fish. We’ll discuss the most effective ways to manage your water weeds, and how long it should take to see results. We work hard to answer any questions you may have about our treatments and our service. We grew up fishing and boating on East Tennessee’s waterways and we’re proud to keep them clean and healthy. We treat our customers like neighbors…because they are! Use our contact form or call us at 865-622-8282. We’ll get some quick details like the location of the water you want treated and your e-mail address. Based on GPS mapping and your description, we’ll send you a quote for treatment and monitoring within 12 hours of your contact. Give us the go, and we’ll monitor and treat your water on the approved schedule, leaving you free to enjoy your lake or pond year-round!